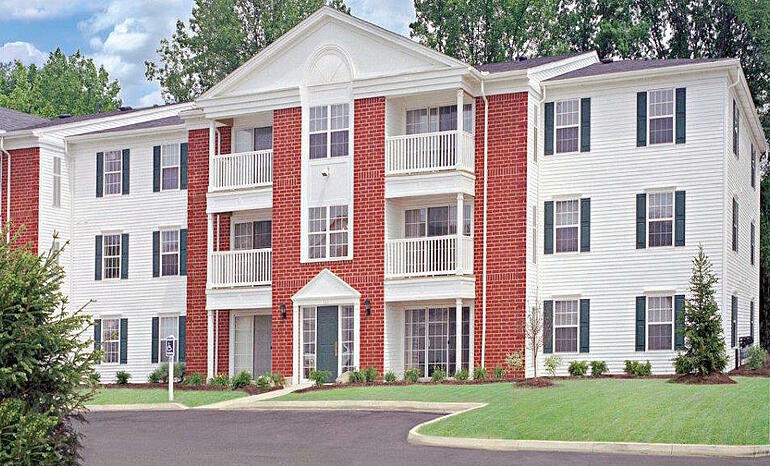 Headquartered in North Royalton, Gross Builders has built and managed a large portfolio of homes and apartment buildings — in Ohio, Tennessee and Alabama — since 1916. With nearly 100 years of homebuilding and property management experience, it’s safe to say this well-established, family-owned company has witnessed quite a few changes over the years in the way business is conducted. Today, 10 days is a typical turnaround, however, there are times in the summer when apartment units need to turn in as little three days. With quicker turns, Chris had even less time to worry about the grass on his properties. “Jim Schill’s reputation has a lot to do with it,” Chris says in regards to his decision to hire Schill Grounds Management. “And the Schill organization is big enough to take on our demands. We’ve got 18 properties, from Olmsted Falls to Solon to Portage Lakes. We have some large apartment complexes that are 30 to 35 acres." Monday, the northwest corner of the property is mowed. Tuesday, the southwest corner is mowed. Wednesday, it rains, so nothing gets mowed. Hopefully by Friday, the last of the mowing wraps up. Monday, the mowing starts all over again. 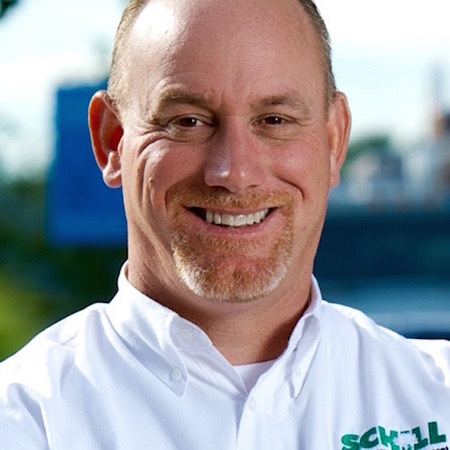 “When Schill comes in, they do everything in one fell swoop and get out of there,” Chris says. “You’re not hearing mowers all week long; the mowers and other equipment they have can really make the turf look like a golf course versus the equipment we were putting on it.” Schill has the largest fleet of propane-powered mowers of any commercial grounds management company in Northern Ohio. 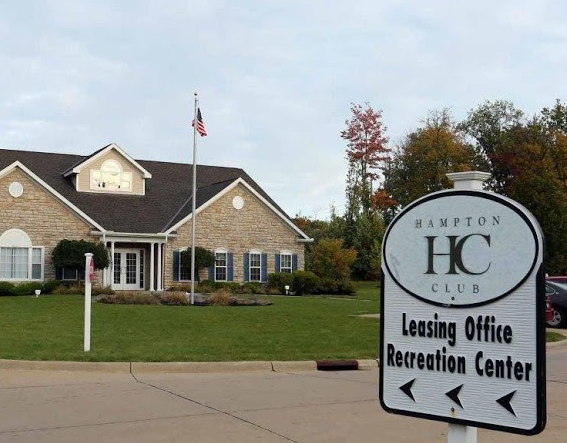 Since taking over the lawn care needs of six Gross Builders’ sites in early 2014, the North Ridgeville-based commercial landscaper is now providing lawn care and weed control for Gross’ entire Ohio portfolio. 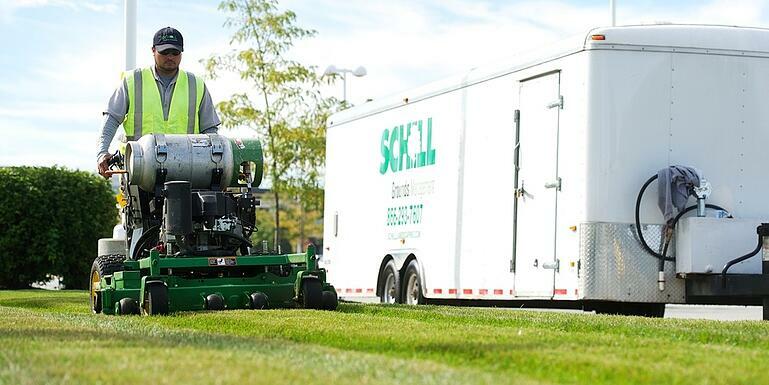 Almost immediately, Schill crews were able to introduce consistency and uniformity back into Gross’ lawn care program. String trimming — Trimmers (aka weed whackers) level out hard-to-reach grass so that it blends in seamlessly with mower cut grass. Stick edging — With a rotating metal blade, edgers give properties that manicured look by creating definition between hard surfaces and the lawn. Surface blow-off — After mowing, trimming and edging, loose grass clippings are blown back into the lawn and off sidewalks and driveways. Weeding beds — From applying pre-emergent herbicides to weeding landscape beds, weed management prevents weeds from getting out of control on your property. These basic but necessary lawn care services can be the difference between a good lawn and a great lawn for any type of commercial real estate. Here in northern Ohio, many of the properties Gross Builders built and manage are between 10 and 20 years old. As these properties continue to age, Chris says allocating more budget money into a property’s exterior appearance — including turf — is a must. In setting this “best foot forward” expectation, it’s important for property owners and managers to partner with a landscape contractor that shares in your vision. You hold high expectations for the appearance of your landscaping — hire a grounds management provider with the same goals. Photos of property exteriors provided by Gross Builders.